Haim Nagid was born in 1940 in Bucharest, Romania, and came to Israel in 1948. He studied literature, philosophy and education at Tel Aviv University and graduated with a PhD from the Department of Theatre Arts. A poet, a playwright and a literary critic, Nagid has published also a novel. 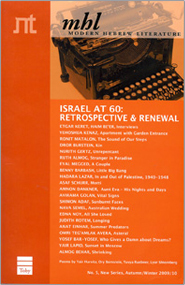 He served as editor of the literary supplement of the daily Maariv and later as chairman of the Union of Writers in Israel (2003-2008). At present, he is the chief editor of the union's publishing house, Safra, which he founded in 2006, as well as editor of its literary periodical Gag and co-editor of Teatron, a quarterly for contemporary theater. He also lectures on visual literacy at the Master Degree School of Kibbutzim College. Nagid received the Mati Kats Prize for Poetry (1971), the Prime Minister's Prize (1988), the Dov Sadan Prize for Jewish Studies (1996), the Ramat Gan Prize for Lifetime Achievement (2011) and the Minister of Culture Prize for Editing (2014).